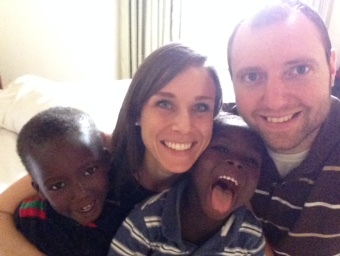 Our first family selfie in Ghana after 5 hours at the embassy and miraculously passing the visa interview! The outpouring of love, support and prayers for our family during the years leading up to bringing our boys home is one that continues to humble me and amaze me. All I have to do is think about it and my eyes well up with tears. It truly humbles my heart and has filled me with profound gratitude. I have always believed in the power of prayer, but since going to Ghana I see just how tangible it is. For years family and friends have said they were praying for us, especially throughout the adoption process. I heard what they were saying and knew they were sincere, but it’s one thing to know with your mind and another to believe with your heart. Over two years of praying, waiting and sometimes wondering if God was hearing any of it. In honesty, also moments of doubt wondering if my prayers were doing any good. I am reminded of what my 6 year old nephew said so simply and profoundly as he continued to pray for his new cousins, “when everything is ready and Jesus says it’s time then it will happen.” Such prophetic words spoken from a child. All in God’s perfect and loving time, yet it can be so easy to lose sight of. Now that our sons are home it seems so clear that not a single prayer uttered was ever wasted or went unanswered. Prayers that guided us through the process. Prayers that sustained us during our travels. Prayers that have aided our sons in transitioning so well. Since returning home complete strangers will come up to our family after Church and say they have been praying for us. People I have never met have sent us cards in the mail mentioning their prayers for my husband and I for years. I am so humbled. As we continue to receive cards, words of congratulations and the thoughtfulness of so many I now know I have seen the visible body of Christ. A community of faith near and far that has offered so much love for two little boys they have never met. When I put the boys to bed at night and thank God for my wonderful life, I have begun to realize this is all much bigger than just our family of four. You always bring tears of joy! So happy for you and Aaron…for your family. It astonishes me when I learn of those who have been praying for me. Thanks for sharing! Great wisdom from that 6 yo. You are definitely a blessed family, and with great blessings I’m sure will come great responsibilities. I imagine God has very interesting plans not only for you and your husband as a couple but also for your boys. In this country where black men are constantly the subject of controversy, God has charged you with the opportunity to make a great impact by raising them in a loving prayerful environment. I think about that a lot with my own son. How exciting to see how God decides to use all of you to further His kingdom! Enjoy every selfie worthy moment with all the men in your life! what a beautiful witness, and testimony of prayer. A friend of my moms at church, told me she was praying for us, and said “I really believe in the power of prayer.” it made me pause a moment as I realized my oftentimes own lack of faith.